A Chinese political cartoonist forced into exile and a Russian prisoners and LGBT rights activist convicted under the country’s draconian anti-protest law were among the winners of the 2017 Index on Censorship Freedom of Expression Awards. The winners, announced on Wednesday evening at a gala ceremony in London, also included a crusading news organisation battling corruption in the Maldives and a group tracking Turkey’s internet shutdowns. 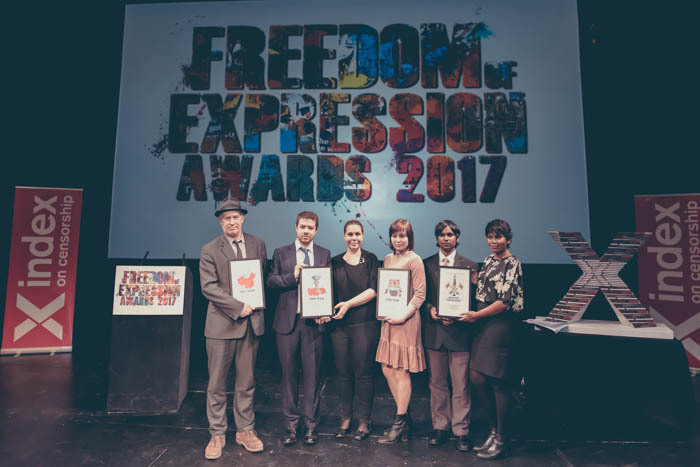 The winners were: Chinese political cartoonist Rebel Pepper (Arts); Russian human rights activist Ildar Dadin (Campaigning); Digital collective Turkey Blocks (Digital Activism); news outlet Maldives Independent and its former editor Zaheena Rasheed (Journalism). Drawn from more than 400 public nominations, the winners were presented with their awards at a ceremony at the Unicorn Theatre, London, hosted by comedian Katy Brand. Actors, writers and musicians were among those celebrating with the winners. The guest list included activist Bianca Jagger, artist Bob and Roberta Smith, tech expert Nicole Yershon journalists Matthew Parris and David Aaronovitch, lawyer Nancy Hollander, novelist Hilary Mantel and director Peter Kosminsky. Winners were presented with cartoons created by Aseem Trivedi, an Indian political cartoonist and activist, known for his Cartoons Against Corruption campaign. High-res versions of the awards cartoons can be found here. Neither Rebel Pepper nor Ildar Dadin could join the ceremony in London. Dadin was represented by his wife and campaigning partner Anastasia Zotova. Rebel Pepper delivered his acceptance speech via video. Each of the award winners becomes part of the third cohort of Freedom of Expression Awards fellows. They join last year’s winners — Zaina Erhaim (Journalism), Bolo Bhi (Campaigning), GreatFire (Digital Activism), Murad Subay (Arts), Smockey (Music in Exile) — as part of a world-class network of campaigners, activists and artists sharing best practices on tackling censorship threats internationally. Through the fellowship, Index works with the winners – both during an intensive week in London and the rest of the awarding year – to provide longer term, structured support. The goal is to help winners maximise their impact, broaden their support and ensure they can continue to excel at fighting free expression threats on the ground. Judges included Harry Potter actor Noma Dumezweni, Hillsborough lawyer Caoilfhionn Gallagher QC, former Vanity Fair editor Tina Brown, as well as Anab Jain, TED fellow and co-founder of Superflux, and Stephen Budd, chairman of the Music Managers Forum. This is the 17th year of the Freedom of Expression Awards. Former winners include activist Malala Yousafzai, cartoonist Ali Ferzat, journalists Anna Politkovskaya and Fergal Keane, and Bahrain Center for Human Rights. Guests were treated to food provided by Ganapati Restaurant and beer created by craft brewery Flying Dog. Further details about the award winners are below. For interviews with the award winners, who are in London until Friday 21 April, please contact David Heinemann at [email protected]. Videos, photographs and other content related to the awards night will be available beginning 11am on Thursday 20 April. Please contact Sean Gallagher at [email protected]. Index on Censorship is grateful for the support of the 2017 Freedom of Expression Awards sponsors: SAGE Publishing, Google, Private Internet Access, CNN, Vodafone, Vice News, Doughty Street Chambers, former Index Award-winning Psiphon, Gorkana, Edwardian Hotels and Flying Dog Brewery. Additional consideration provided by PROPERCORN and Divine Chocolate. Cartoonist Wang Liming (aka Rebel Pepper) was presented with the Index 2017 Freedom of Expression Award Arts award for satirising Chinese Premier Xi Jinping and lampooning the ruling Communist Party. For his efforts Rebel Pepper has been repeatedly persecuted. In 2014, he took exile in Japan after serious threats against him were posted on Chinese government-sanctioned online forums. The Chinese state has since disconnected him from his fan base by repeatedly deleting his social media accounts, conversations with friends and family are under state surveillance, and exile has made him isolated, bringing significant financial struggles. Nonetheless, Rebel Pepper keeps drawing, ferociously criticising the Chinese regime. A Russian prisoners and LGBT rights activist, Dadin was the first, and only, person to be convicted under a notorious 2014 public assembly law. Aimed at punishing anyone who breaks strict rules on protest, the law was enacted to silence dissent after a wave of demonstrations following President Vladimir Putin’s last election victory. Dadin’s crime was to stage a series of one-man pickets, often standing silently with a billboard, attempting to duck the cynical law and push for free expression. For his solo enterprise, Dadin was arrested and sentenced to three years imprisonment in December 2015. In November 2016, website Meduza published a letter smuggled from Dadin to his wife, exposing torture he suffered alongside fellow prisoners. In February 2017, a Russian court quashed his conviction and Dadin was released. Turkey Blocks is a digital transparency project documenting internet blackouts in a country marked by increasing authoritarianism, a strident crackdown on press and social media and numerous human rights violations.Turkish-British technologist Alp Toker brought together a small team to investigate internet restrictions and using Raspberry Pi technology they built an open source tool able to reliably monitor and report both internet shut downs and power blackouts in real time. Using their tool, Turkey Blocks have since broken news of 14 mass-censorship incidents during several politically significant events in 2016. The tool has proved so successful that it has been implemented elsewhere globally. Website Maldives Independent, which provides news in English, is one of the few remaining independent media outlets in a country that ranks 112 out of 180 countries on the Reporters Without Borders Press Freedom Index. In August 2016 the Maldives passed a law criminalising defamation and empowering the state to impose heavy fines and shut down media outlets for “defamatory” content. In September, Maldives Independent’s office was violently attacked and later raided by the police, after the release of an Al Jazeera documentary exposing government corruption that contained interviews with former editor Zaheena Rasheed, who had to flee for her safety. Despite the pressure, the outlet continues to hold the government to account. The Index on Censorship Freedom of Expression Awards recognise those individuals and groups making the greatest impact in tackling censorship worldwide. Established 17 years ago, the awards shine a light on work being undertaken in defence of free expression globally. Often these stories go unnoticed or are ignored by the mainstream press. Through the fellowship, Index works with the winners – both during an intensive week in London and the rest of the awarding year – to provide longer term, structured support. The goal is to help winners maximise their impact, broaden their support and ensure they can continue to excel at fighting free expression threats on the ground. Index on Censorship is a UK-based nonprofit that campaigns against censorship and promotes free expression worldwide. Founded in 1972, Index has published some of the world’s leading writers and artists in its award-winning quarterly magazine, including Nadine Gordimer, Mario Vargas Llosa, Samuel Beckett and Kurt Vonnegut. Index promotes debate, monitors threats to free speech and supports individuals through its annual awards and fellowship program.